So: poverty increases the risk of depression, which can weaken attachment and therefore slow early child development. A weaker developmental start increases the risk of poor educational outcomes, which in turn heightens the risk of future poverty. And so, the cycle turns. 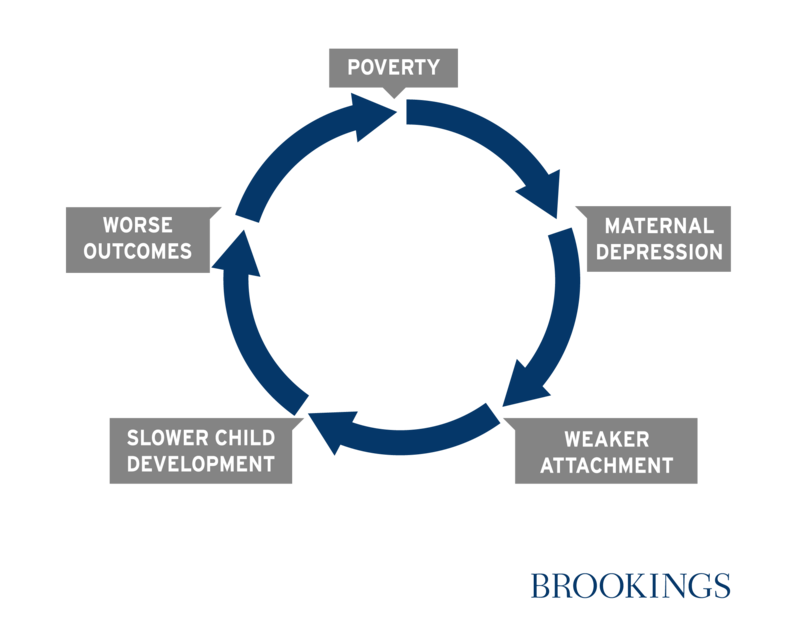 In a new paper for Brookings, “The Effects of Maternal Depression on Early Child Development and Implications for Economic Mobility ”, we examine the evidence for each stage of this cycle of intergenerational disadvantage, as well as at policies aimed at each stage of the cycle. In terms of policy, there is no single “magic moment” in the cycle to intervene: multiple interventions will be required. Many of these would be justified on their own account, of course: but here we highlight their potential to help break or at least weaken the vicious cycle. Legacy for Children (Legacy), a group-based intervention that seeks to improve mothers’ sensitive and responsive parenting and enhance parent-child interactions with the ultimate goal of improving children’s healthy emotional development. Evaluation of behavioral outcomes at 48 month and 60 months showed positive effects. Attachment and Biobehavioral Catch-Up, or ABC is an intervention designed to help parents be more nurturing toward children at high risk of neglect. Children in recipient families showed more typical cortisol production, according to an RCT study, suggesting that the intervention improved children’s biological regulation in response to stress. Universal screening and education for postpartum depression is not mandatory in many states; others cover psychosocial risk assessments and counseling during pregnancy. These are important steps forward, and other states should follow suit. Postpartum care from obstetrician-gynecologists should be an ongoing process, rather than a single encounter, according to a new report from the American College of Obstetricians and Gynecologists. An initial assessment during the first 3 weeks could be followed by individualized ongoing care as needed for up to 12 weeks. These comprehensive check-ups would include assessments of mood and emotional well-being to help mothers successfully transition from pregnancy to parenthood. These are just four examples of potentially fruitful policy areas: for more details, see the full background report. There is much more research to be done here, not least in terms of the difficult task of teasing out causal relationships. But it certainly looks as if maternal depression is an under-acknowledged factor in the intergenerational transmission of poverty, and lack of economic mobility. Policymakers focused on economic opportunity and those focused on mental health may discover they are working on two sides of the same coin.